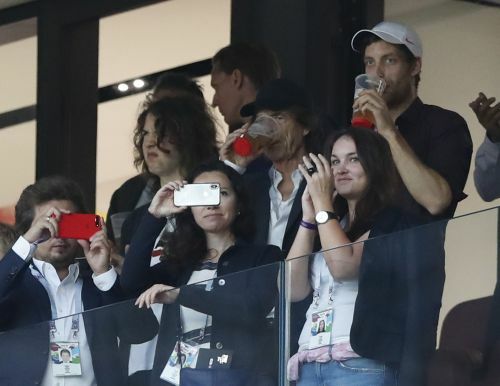 MOSCOW (AP) — In a literal case of life imitating art, Mick Jagger went to see England and England lost. The Rolling Stones frontman was at the Luzhniki Stadium on Wednesday to see Croatia beat England 2-1 in extra time in the World Cup semifinals. Last year, Jagger unexpectedly released a pair of solo songs. One of the songs was called "England Lost," and its starts with the tale of someone ostensibly going to watch England play a soccer match and finishes with some political commentary about Britain's exit from the European Union. "I went to see England, but England's lost," Jagger sings. "And everyone said we were all ripped off." Jagger arrived in Russia for the World Cup after he and his bandmates completed a short European tour in Warsaw on Sunday. He attended Tuesday's match between France and Belgium in St. Petersburg and then came to Moscow to see his home national team play — and lose to — Croatia. Jagger has been a regular in recent years at major soccer tournaments. He attended the World Cup final four years ago in Brazil and also watched the United States play Ghana in the round of 16 at the 2010 tournament in South Africa. He was at that match alongside former President Bill Clinton, who had a cameo in the Martin Scorsese-directed Rolling Stones concert film "Shine A Light." But Jagger, who is also a keen cricket fan, has been thought of as a bit of a jinx at World Cup soccer stadiums. During another European tour in 2014, Jagger wrote some encouraging words on Twitter ahead of England's match against Uruguay in the group stage. "Let's go England! This is the one to win! !," he wrote. England lost. Jagger then predicted at a show in Rome that Italy would beat Uruguay in a subsequent group match. Italy lost. At an earlier concert in Lisbon, Jagger said Portugal would win the title in Brazil. The Portuguese were eliminated in the first round. Then came the semifinals, which essentially cemented Jagger's reputation as a harbinger of bad luck in Brazil. The man who sang "Hoo Doo Blues" on the band's most recent album went to Belo Horizonte to see the host nation face Germany with his son Lucas, who is half Brazilian. Brazil lost, big time. Those examples only reinforced the theory that began in South Africa in 2010. A day after the U.S.-Ghana match, Jagger attended England's game against Germany. England lost. He then went to watch Brazil play the Netherlands in the quarterfinals with his son, who was wearing the national team's yellow jersey. Yes, Brazil lost. Perhaps it was that dire history that prompted Jagger to write "England Lost," which he released last July — one day after his 74th birthday — along with "Gotta Get A Grip." At the time of release, Jagger said in a statement that the song was about more than just watching his team lose a soccer match. "It's obviously got a fair amount of humor because I don't like anything too on the nose," Jagger said then, "but it's also got a sense of vulnerability of where we are as a country." Regardless of why he wrote "England Lost," it certainly didn't help England win on Wednesday.